Crafting With Claudie: 500 Subscribers! Guys! Gals! Everyone! Today I reached 500 subscribers! I am so excited. I told my husband that I felt like I had official Youtube status now, not that I'm really sure what that means. It sounds cool though! When I started this channel, I just wanted to share what I knew with others. 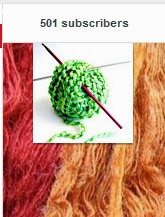 I thought it might reach a few people and maybe help my friends when they wanted me to show them how to do a certain stitch or something, but 500 subscribers! I didn't expect to see that number for a long time, if ever. If you could see me right now, you would see a ridiculous smile on my face because I'm so happy! I just want to say thank you to each and every one of you who have subscribed, commented, liked, or just watched anything that I've done. You people are awesome!